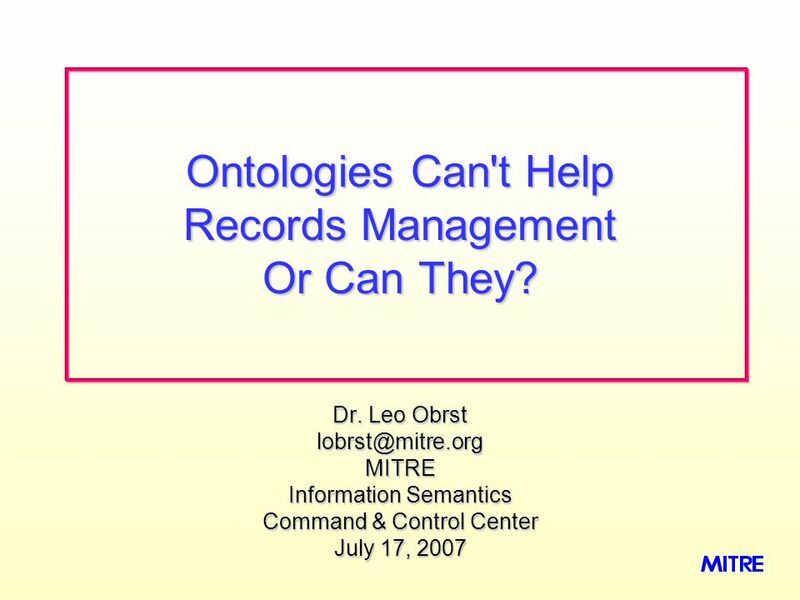 1 Dr. Leo Obrst lobrst@mitre.orgMITRE Information Semantics Command & Control Center July 17, 2007 Ontologies Can't Help Records Management Or Can They? 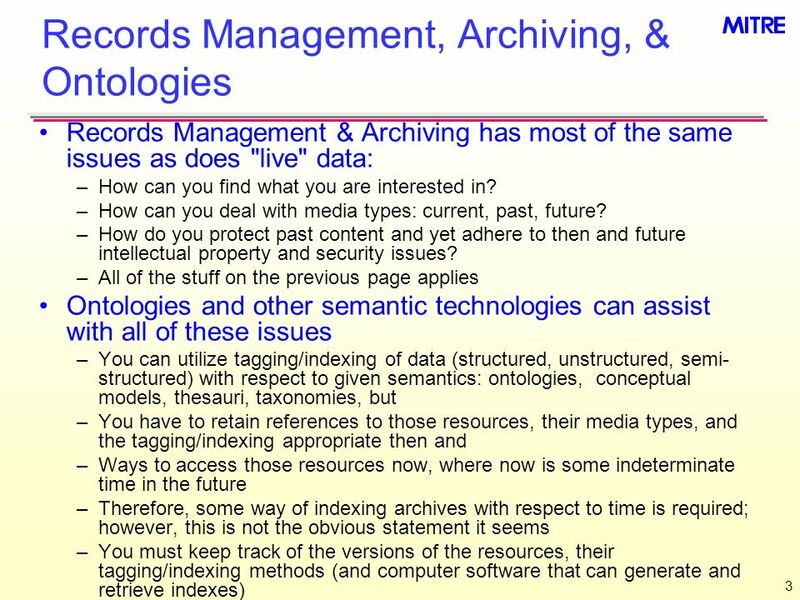 2 2 Ontologies Can't Help Records Management Records Management & Archiving have problems very different from other applications So, Records Management does not address: –Structured data: Database storage, access, query/retrieval –Unstructured data: meta-data tagging/indexing, information extraction, categorizing, retrieval –Media types: text, graphic, audio, voice, video, etc. 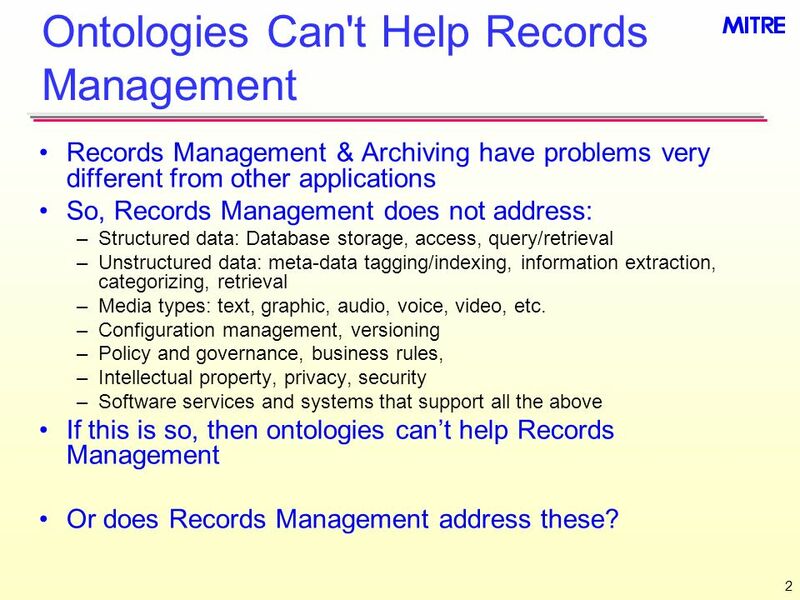 –Configuration management, versioning –Policy and governance, business rules, –Intellectual property, privacy, security –Software services and systems that support all the above If this is so, then ontologies cant help Records Management Or does Records Management address these? 4 4 Mapping Issues Involved in the issues of both major points are mapping issues: –The ontology resources may require other resources they either: Import Map to (align with, utilize, etc.) And along with those resources' media types and software accessors –How do you create an architecture which can map to resources that are in the future, and not yet conceived? Assume that extensibility issues will be sufficiently dealt with by the future archivers for all of the past resources, accessors, etc., or Build a general enough architecture today that will permit, in fact mandate, this? –All of the above is configuration management and versioning, except not only applied syntactically, but semantically. 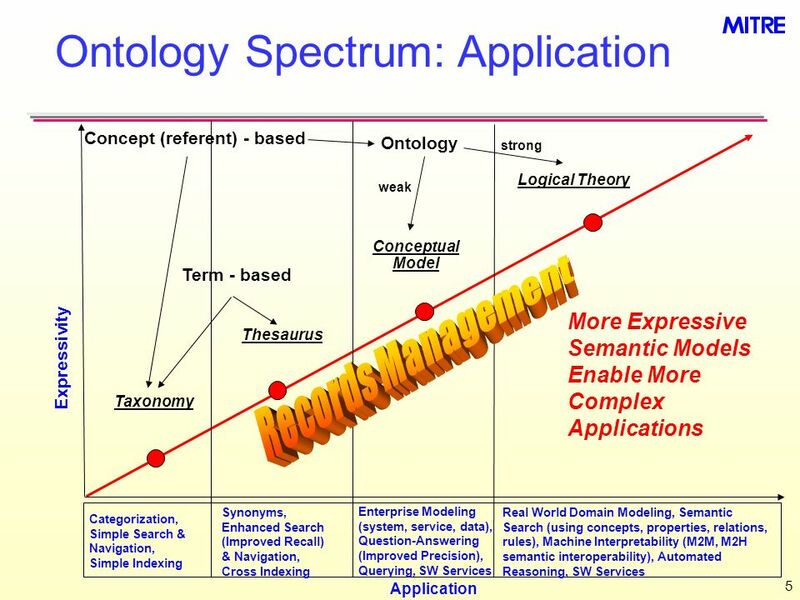 Download ppt "Dr. Leo Obrst Information Semantics Command & Control Center July 17, 2007 Ontologies Can't Help Records Management Or Can They?" Ontology-enhanced retrieval (and Ontology-enhanced applications) Deborah L. McGuinness Associate Director and Senior Research Scientist Knowledge Systems. Sunita Sarawagi.  Enables richer forms of queries  Facilitates source integration and queries spanning sources “Information Extraction refers to the. Xyleme A Dynamic Warehouse for XML Data of the Web. MS DB Proposal Scott Canaan B. Thomas Golisano College of Computing & Information Sciences. COMP 6703 eScience Project Semantic Web for Museums Student : Lei Junran Client/Technical Supervisor : Tom Worthington Academic Supervisor : Peter Strazdins. Internet Resources Discovery (IRD) IBM DB2 Digital Library Thanks to Zvika Michnik and Avital Greenberg. ReQuest (Validating Semantic Searches) Norman Piedade de Noronha 16 th July, 2004.